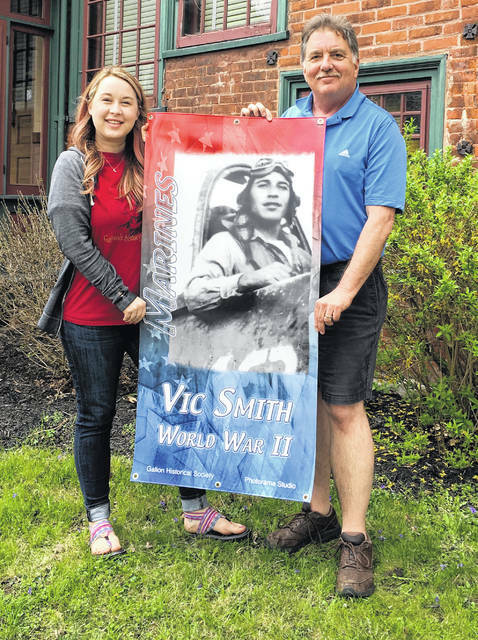 GALION — The Galion Historical Society has announced a new banner project for uptown Galion designed to pay tribute to this community’s many veterans. It’s called Operation: Honor. Respect. Recognize. and is a project of the historical society, Photorama Studios, The City of Galion and the Community Foundation for Crawford County. The banners are similar to those in Heise Park that honor Galion High School’s senior student athletes. Sponsors can purchase banners to honor veterans who have served in our country’s armed forces. The banners will be two feet wide by four feet long and made of a sturdy vinyl material,. They will be hung on Harding Way lamp posts this summer in the historic uptown area. Sponsors may nominate veterans who meet the following criteria: The veteran must be a Galion High School graduate, attended Galion High School or is has been or is a Galion resident. The Galion Historical Society will host sign-up meetings for the banners May 22 from 6-8 p.m. and May 23 from 6-8 p.m. at the Historic Grace Church, 130 W. Walnut St. Please enter via the back door. The veteran’s branch/branches of service. When the veteran served (what conflict, or during peace time and what years. The sponsor payment is $45, or $40 with the Galion Historical Society making a $5 contribution. These photos will not be returned to the sponsor as the Galion Historical Society will keep these copies for their military archives. Currently, there is funding to hang 80 veterans banners. Applications for a banner will be taken on a first-come, first-serve basis the night of registration. If you have any questions about the Veteran Banner Project, please call the Galion Historical Society office at 419-468-9338.